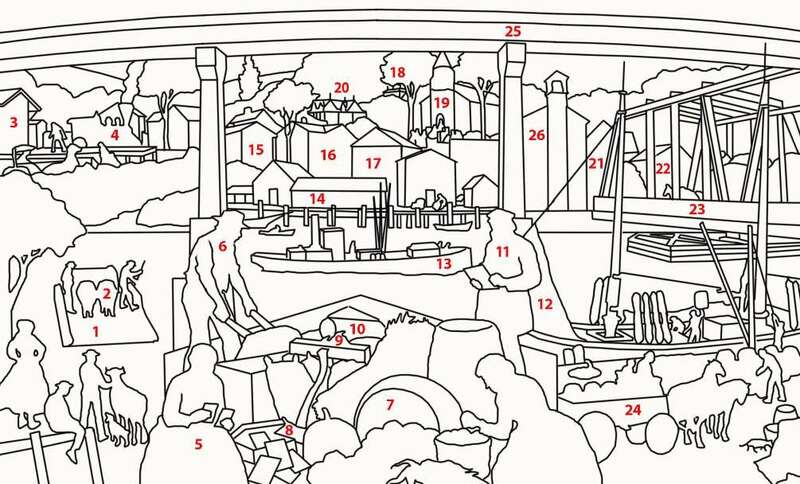 This activity is based on a painting titled, “Saugatuck in the 19th Century.” It depicts Saugatuck as part of Connecticut river commerce and manufacturing. The artist, Robert Lambdin, was a Westport resident who created the mural for the Westport Bank & Trust Company’s Saugatuck branch when it opened in 1970. The painting shows the various types of transportation and methods of trade that developed throughout the 19th century. A few of the landmarks in the painting are still standing today, including the original firehouse and the swing bridge and train depot. While the painting emphasizes the 19th century, the artist included I-95, which was a 20th-century development. However, the framing of the mural with the I-95 overpass creates an interesting dynamic within the mural as a way to think about economic progress. In what ways has one town--and Connecticut--changed and/or stayed the same over time? In what ways have bodies of water shaped the development of Connecticut over time? What has motivated innovations in transportation throughout Connecticut’s history? How does an artist tell a story? Saugatuck in the 19th Century by Robert Lambdin – Westport Public Schools. Legend for Saugatuck in the 19th Century mural by Robert Lambdin, part 1. 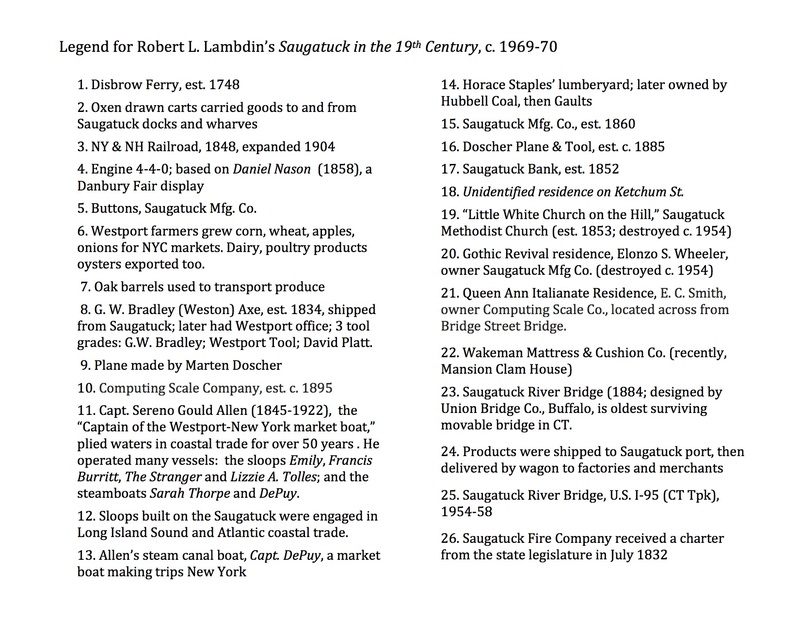 Legend for Saugatuck in the 19th Century mural by Robert Lambdin, part 2. Introduce the painting and ask students to SEE, THINK, WONDER. What do they SEE in the mural? What does this mural make them THINK about? What does this mural make them WONDER? SEE: Make observations about the mural. THINK: Make connections using background knowledge. WONDER: Ask questions about the mural. Introduce “economics” and vocabulary terms: buyers, sellers, and trade. Who is trading in the mural? What is being traded? What different types of transportation are people using to trade? What questions would they ask the artist to better understand the mural? How might we find clues or helpful information to learn more about the message within this mural? Research the Art! What time periods are reflected in the painting? Assign students to research the following modes of transportation or industries that are represented in the painting (inquiry circles may be used here too). Have students place these innovations on a timeline in the classroom. In groups, have students create a new title for the painting and explain their rationale for the title. Then, ask students to add to the timeline of transportation (what comes next?) and make predictions about how they would change the painting to reflect their ideas about the future. Why did they choose this title? Why is this painting important for understanding how Westport and other Connecticut communities changed over time? How will the changes they predict for the future of transportation shape the way people live in Westport and other Connecticut communities? 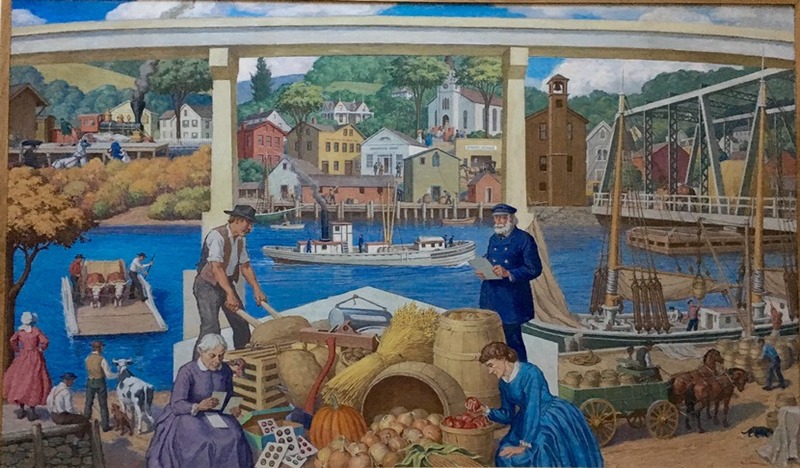 Investigate more about Robert Lambdin and his murals on the Connecticut State Library’s WPA Art Inventory Project. View a map of the Town of Wesport, ca. 1868 from the University of Connecticut’s – Historical Map Collection: Connecticut.